Rubenerd: Why do they need 2 weeks to unsubscribe me? Why do they need 2 weeks to unsubscribe me? After briefly using their service I decided to stop using Evernote, for me having a personal wiki that I host myself and can edit on my iTelephone and my computers made much more sense, plus it's free and doesn't need extra software. 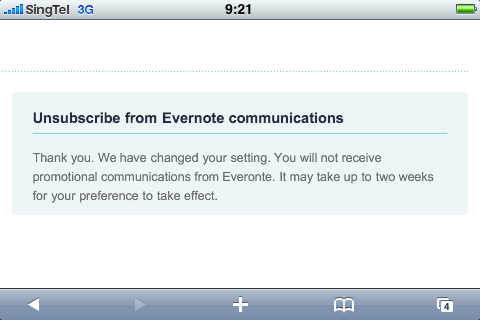 So this morning I severed my final ties and unsubscribed to Evernote's email newsletters. When I did, I got the message you see above. Leaving aside the issue with email newsletters being an archaic and outdated model for sending out information in a world of web feeds like RSS, why do companies that add you to their email newsletter mailing lists always require such an inordinate amount of time to unsubscribe you? Evernote claims here that they need up to two weeks to delete me from their database; an action that on any other database would only takes milliseconds. There is no technological reason I can see for this. So in rhetorical style we must ask ourselves: why do they do this? Is it so they can keep you on their list for an extra two weeks and send you more advertising? Is it like an opt-out system that some laws now require, but one that guarantees a minimum of two weeks of advertising to unsuspecting people? Again it wouldn't be so annoying if this kind of silly behaviour were only exhibited by a few select companies, but virtually everybody does it. I wonder if there's a blacklist for companies that pull these kinds of stunts?